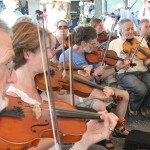 The 39th annual 3-day Old Songs Folk Festival­ of Traditional Music and Dance will be held on June 28, 29 & 30, 2019 at the Altamont Fairgrounds, Rt. 146, Altamont, NY. Music with Roots! 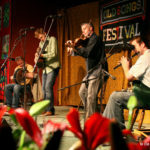 Old Songs celebrates Folk, Celtic, Quebecois, Roots, Americana and World music; from Ireland, Scotland, England, Quebec, Italy, South Africa, the Midwest, Appalachia, New England and more. 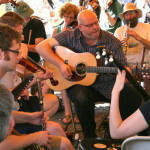 Hear new music from Contemporary Songwriters. 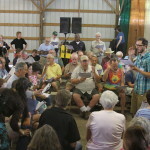 Sing, Dance, Jam, and Listen at this highly participatory event for the whole family, Old Songs encourages audience members to join jam sessions, take part in learn-how sessions, sing sacred harp, move their feet to our great dance bands or take a Friday afternoon class. 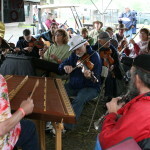 School age children who play an instrument can participate in the “Great Groove Band” during the festival with the help of music coaches and musical instruction. 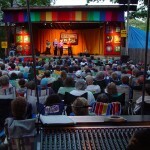 The band does a stage performance on Sunday. 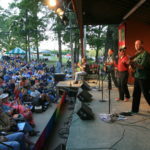 There are three main stage concerts, each featuring multiple artists on Friday & Saturday from 6:30 -11 pm, and Sunday 3:30 -7pm in the leafy, open-air main stage area (rain site also provided). 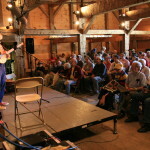 During the day on Saturday and Sunday there are 100 plus performances, dances, interactive workshops, and jams in ten areas around the grounds. An extensive artisan area and diverse food concessions are also available. 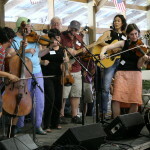 Listen to featured performers, representing many regions and countries: Emma’s Revolution • Bill Staines • Sharon Katz & The Peace Train • John McCutcheon • Mary Flower • Bruce Molsky • Archie Fisher • Tommy Sands • Rob van Sante & John Connolly • Beppe Gambetta • Bon Débarras • Keith Murphy & Becky Tracy • Poor Man’s Gambit • The Vox Hunters • Musique à bouches • Cathy Barton & Dave Para • Sam Gleaves, Deborah Payne & Hasee Ciaccio • Magpie • Lil Rev • Charm City Junction & Footworks • Ken & Brad Kolodner Trio • Mulebone • Sally Rogers & Howie Bursen • Clare Horgan & Matt Diaz • Pete’s Posse • Tui (Jake Blount & Libby Weitnauer) • Heather Wood • Bill Destler & Rebecca Johnson • John Roberts • Deb Cowan • Fennig’s All Stars • Stefan Amidon • Bill Jones • John Dickson • The Great Groove Band • Ron Gordon • Jake Thomas • and Roger the Jester! 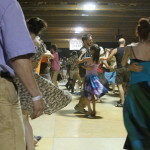 All day and evening long, dancing on a wooden floor, Contras, Sean-nós, Quebecois step dancing, and more, with music by Pete’s Posse, Charm City Junction & Footworks Percussive Dance Ensemble, Bon Débarras, The Vox Hunters, and Fennig’s All Stars with callers Ron Blechner and Janine Smith. 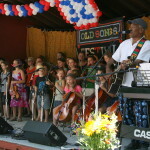 Tickets may be purchased online at festival.oldsongs.org, by phone at 518-765-2815, or at the festival gate.